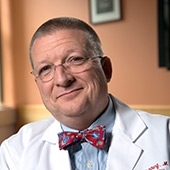 Dr. Warf received his MD from Harvard Medical School in 1984, completed his neurosurgery training at Case Western Reserve University in 1991, and was the first Fellow in Pediatric Neurosurgery at Boston Children’s Hospital from 1991 to 1992. He was Chief of Pediatric Neurosurgery and Director of Surgical Education at University of Kentucky until 2000, at which time he moved his wife and 6 children to Uganda to work with CURE International, where he was the founding Medical Director of the CURE Children’s Hospital of Uganda, the only pediatric neurosurgery specialty hospital in sub-Saharan Africa, until 2006. He is currently Director of Research for the hospital. During his years in Uganda, Dr. Warf characterized neonatal infection as the chief cause of infant hydrocephalus in the region, and highlighted the previously under-recognized burden of pediatric hydrocephalus on the continent. During that time he also developed and validated a new procedure to treat infant hydrocephalus (ETV/CPC) that avoided the need for creating shunt dependence, which is especially problematic in low-income countries. He is the founding Medical Director of CURE Hydrocephalus, a specialty program within CURE International that trains and equips surgeons in developing countries to perform ETV/CPC. He received the Humanitarian Award from the American Association of Neurological Surgeons in 2007, and a MacArthur “Genius” Award in 2012. He is currently Associate Professor of Neurosurgery at Harvard Medical School, Affiliate Faculty in the Harvard Program in Global Surgery and Social Change, and Director of Neonatal and Congenital Anomalies Neurosurgery at Boston Children’s Hospital, where he holds the endowed Hydrocephalus and Spina Bifida Chair. He serves on the Global Expert Panel for the International Federation for Spina Bifida and Hydrocephalus, the Advisory Board of the Boston Children’s Hospital Global Health Program, the G4 Alliance board, and the CURE International Board of Trustees. He currently chairs the PUSH! Executive Committee.